On 6 December the Bulgarian Orthodox Church commemorates St. Nicholas, Archbishop of Myra. On the same date the calendar of folklore marks the feast of Nikulden and its imagery and rituals mix together pagan and Christian elements. More about this important day in this edition of weekly Folk Studio written by Albena Bezovska. In the Christian tradition St. Nicholas has been nicknamed the Wonderworker as recognition for the dozens of wonders that he worked during his lifetime and after his demise too. In Bulgaria he is known as Saint Nikola and is venerated as the protector of fishermen, sailors, merchants, millers and hunters. One of the most popular stories about him recounts his miraculous victory over an awesome sea storm. Once upon a time the priest started on a pilgrimage to the Holy Sepulcher. A violent storm broke out at sea and one of the sailors was wounded so badly that some of his comrades thought he could be dead. 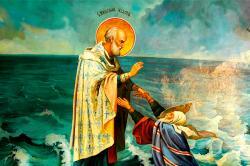 Saint Nicholas resurrected the sailor and calmed down the storm with his prayers. In the folklore version of the same story the storm cracked open the bottom of the boat and there was water gushing in the vessel. Saint Nikola took fish from the sea and plugged up the hole with it. In this way he saved the lives of all. This story explains why on Nikulden the must in the menu is fish. In the Bulgarian tradition stuffed carp is served on 6 December. In some of the country’s regions it is roasted over rice or groats. In other regions the carp is covered with dough, and the dish is called Nikulden ribnik, from riba, fish. Regardless how the dish was prepared it had to be blessed in church before the festive meal. In small villages local priests paid brief visits to every home to bless the fish for dinner. Apart from the stuffed carp, the meal for St. Nicholas Feast includes two types of ritual bread. One of the loaves which is also used on other major holidays, is called bogovitsa from the Bulgarian word bog that stands for god. The other was a ring-shaped bun and was decorated with dough figures of a ship and a fish. In folk beliefs St. Nikola protects the family, the home, the wealth and the livestock. For this reason in many regions of Bulgaria St. Nicholas Feast is also a big family occasion. In Southeastern Bulgaria the night on the eve of St. Nicholas Day the first incensed supper is served dedicated to the mythical creature that is the guardian of the hearth. There is another story that is part of the passional of St. Nicholas. It is about a man who got very poor and consented to his eldest daughter working as a prostitute to keep the large family. Archbishop Nicholas was keen to save the poor girl and left some cash in the family house, enough to find a husband for her. In this way, the sisters of the girl married as well and the family tragedy was prevented by the archbishop of Myra. In some parts of Bulgaria the Feast of St. Nicholas is the time for a few pre-marriage rituals. Girls who are mature enough to marry go to church and leave gifts at the icon of St. Nicholas. A special girls’ chain dance is played as the community gathers for the celebrations. In folklore mythology, as God divided the Earth and Heaven among his six sons, Nicholas was given all the water expanse on Earth. Therefore he is the sovereign of the seas, rivers, lakes and of the underwater world too. So as to be able to manage his estates well and keep an eye on the endless water, God gave him wings. In the folk tales St. Nicholas is able to divide his soul from his body and project himself in several locations, all at once. Both the folklore and Orthodox Christian versions of the Feast of Saint Nicholas give the start to a cycle of rituals bidding farewell to the old year and welcoming the new one. In the present-day world 6 December is the start of the final weeks of the year when everybody is stressed out shopping for the Christmas holidays. Christmas decoration is bought and arranged, as well as the Christmas gifts for children who believe that they are brought over by the good Santa Claus. The old man was first mentioned in 18 c. however the Santa Claus tradition is much older. In the early 17 c. Dutch settlers moved to North America and founded New Amsterdam, today New York. One of the traditions that they brought over to the New World was the exchange of gifts linked to the St. Nicholas Feast. In their language St. Nicholas is known as Sinter Klaas. In English it is Santa Claus, deriving from Saint Nicolas. It is worth mentioning that there is a basilica in the place where the saint was first buried. His relics were taken out and moved to the Italian town of Bari in 11 c. Today the lands where he served as a priest are in the territory of Turkey. There he is known as Noel Baba. In the town of Demre close to the saint’s town of birth Myra, stands the basilica restored by the Turkish government. Hundreds of churches have been built to commemorate the saint, and the popular feast though no longer like the traditional one seen in folklore, is invariably one of the biggest family occasions for many Bulgarians. On 6 December is the name day of all who have the names Nikola, Nikolay, Nikolina and the professional day of the Navy, of bankers and those who are engaged in trade.